Not to be confused with Armenian Patriarchate of Jerusalem. Patriarch of the Holy City of Jerusalem and all Palestine, Israel, Syria, beyond the Jordan River, Cana of Galilee, and Holy Zion Theophilos III. Israel, State of Palestine, Jordan, Qatar. 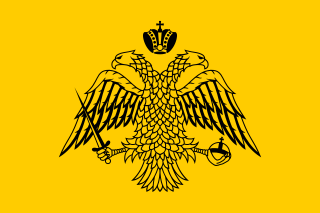 The Eastern Orthodox Patriarchate of Jerusalem (Greek: Πατριαρχεῖον Ἱεροσολύμων, Patriarcheîon Hierosolýmōn) or Greek Orthodox Church of Jerusalem (Arabic: كنيسة الروم الأرثوذكس في القدس‎‎ Kanisatt Ar-rum al-Urtudoks fi al-Quds, literally "Church of the Rûm Orthodox in Jerusalem"), is an autocephalous Church within the wider communion of Eastern Orthodox Christianity. Headed by the Patriarch of Jerusalem, it is regarded by Eastern Orthodox Christians as the mother church of all of Christendom. Christians believe that it was in Jerusalem that the Church was established on the day of Pentecost with the descent of the Holy Spirit on the disciples of Jesus Christ (Acts 2:1-41) and that the Gospel of Christ spread from Jerusalem. The Church celebrates its liturgy in the Byzantine Rite, whose original language is Koine Greek, and follows its own calendar of feasts, preserving the Julian calendar (that is thirteen days behind the Western (Gregorian) calendar). It is also often called "Σιωνίτις Εκκλησία" (Greek: Sionitis Ecclesia, i.e. the "Church of Zion"). The number of Orthodox Christians in the Holy Land is estimated at about 500,000. A majority of Church members are Palestinians and Jordanians, and there are also many Russians, Romanians, and Georgians. The Church's hierarchy is dominated by Greek clergy, which in effect excludes the Arab majority from the Church's upper ranks. This has been a point of endless contention between Greeks in the patriarchate, who are backed in this regard by the Greek government and the Turkey-based Ecumenical Patriarch of Constantinople, and the native Palestinian clergy- some of whom seek to nationalize their Church's leadership. (see Arab Orthodox). 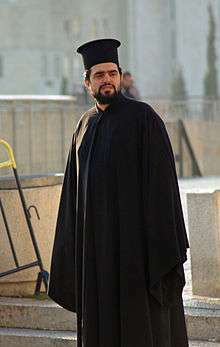 Eastern Orthodox priest in Jerusalem. 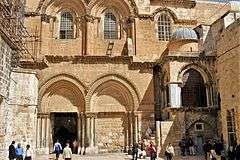 Main entrance to the Church of the Holy Sepulchre, Jerusalem. In a decree issued from the seventh session of the Fourth Ecumenical Council (the Council of Chalcedon) in 451 the Bishop of Jerusalem was elevated to the rank of Patriarch, ranked fifth after the Sees of Rome, Constantinople, Alexandria, and Antioch (see Pentarchy). Since then, the Church of Jerusalem has remained an autocephalous Church. Jerusalem was established as a patriarchate because of the special significance acquired between the First and Fourth Ecumenical Councils; the erection of magnificent Churches; the conversion of a large proportion of the population of Roman and Byzantine Syria-Palestina to Christianity; the coming together of pilgrims from around the world; the importance of outstanding bishops, monks, and teachers of the Church of Jerusalem; the struggles of the Brotherhood of the Holy Sepulchre on behalf of Orthodoxy; and the support of various Emperors of Byzantium. The Brotherhood of the Holy Sepulchre, which is closely linked to the Orthodox Church of Jerusalem, remains the custodian of many of the Christian Holy places in the Holy Land, sometimes jointly with the Roman Catholic Church and the Oriental Churches (Egyptian and Ethiopian Coptics and Armenian Orthodox Christians). Lately there has been criticism of the church leadership by some of the Palestinian members (known as Arab Orthodox) who accuse the Greek-speaking and largely Greek-born leadership of squandering their money and treating their Palestinian members as second-class members. The Palestinian members (Arab Orthodox) have expressed the desire to have local and or Palestinian leaders in positions of authority in their respective districts, in contrast to the tradition (since Ottoman times) of the higher authority positions being occupied by ethnic Greeks. The Orthodox Church is sometimes compared unfavourably in this respect to the Melkite Catholic Church, which has Arabic as its official and liturgical language. The Patriarchate continues to be the subject of continuing allegations of political impropriety, from various political sources. Theophilos's critics claim that he was favored by Israel owing to his ties with key United States officials, such as former CIA chief George Tenet (who is Theophilos's cousin), whom he reportedly met through the Greek lobby in the United States. They note that, remarkably, US Secretary of State Condoleezza Rice held a meeting with Theophilos at her request during a recent trip to Israel. On the other hand, it has also been reported that he, as then Superior of the Holy Sepulcher, merely showed Secretary Rice the holy sites, as he did for President Vladimir Putin of Russia and other dignitaries visiting the Holy Land. Head of the Patriarchate and of the Holy Synod is Patriarch Theophilos III (Ilias Giannopoulos), Patriarch of the Holy City of Jerusalem and all Palestine, Syria, beyond the Jordan River, Cana of Galilee and Holy Zion. 1 2 Eusebius, The History of the Church (Tr. A. G. Williamson, Penguin Books, 1965. ISBN 0-14-044535-8), see summary in Appendix A. ↑ "Jerusalem affairs: Religiously political". Jerusalem Post. December 20, 2007.